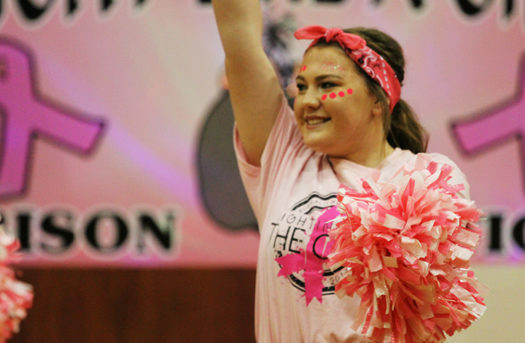 Freshman Addison Lathrop cheers at a pep rally. Freshman Addison Lathrop keeps herself busy being involved in FFA, Student Council and cheerleading, but she lives for softball. She plays in a select team named Diamond Legacy and plays first and pitcher for them, but for the Lady Bison she is the primary pitcher. Lathrop´s hobbies consist of softball and makeup. She plays nonstop softball and loves trying out new things with makeup. Lathrop has hit three home runs so far in the season and hopes for more. ¨I am really happy I hit those home runs; it feels so good,¨ Lathrop said. ¨I hope to hit many more because I love the feeling. Lathrop plans to attend Tarleton University to play softball there and study to be a labor and delivery doctor. Her friends enjoy her sense of humor and can never get enough of her. In the halls, she is usually the student laughing loudest. She competes in floriculture and junior skills for FFA. Her teams have been doing really well in competitions.